Join us for a fun day of yoga, movement, breathing, chatting, exploring and eating. This is a great opportunity to find our more about the academy, the yoga teacher training course, our monthly workshops as well as the instructors. 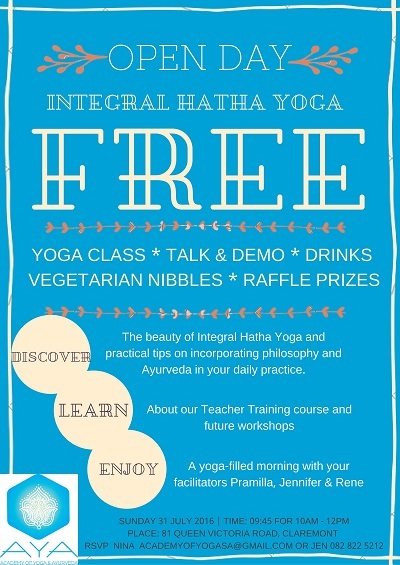 We look forward to spending a morning with you and answering any questions you may have about Integral Hatha Yoga, Philosophy and anything else. Join us on Sunday 31 July from 10:00 – 12:00 in Claremont at Pramilla’s studio.